MMS to e-mail is part of the standard MMSC functionality when a mobile phone is configured to use NowSMS as an MMSC. An MMS client can address a message to either another phone number or an e-mail address. When NowSMS receives an MMS addressed to an e-mail address, it automatically tries to route the message via e-mail. For configurations where NowSMS is not the MMSC, but is instead acting as a gateway to another MMSC, it is possible to configure NowSMS to route MMS messages to an e-mail address. This configuration is similar to the configuration of “Routing MMS Messages to a POP3 Client” as described in Using the POP3 Server. 2.) 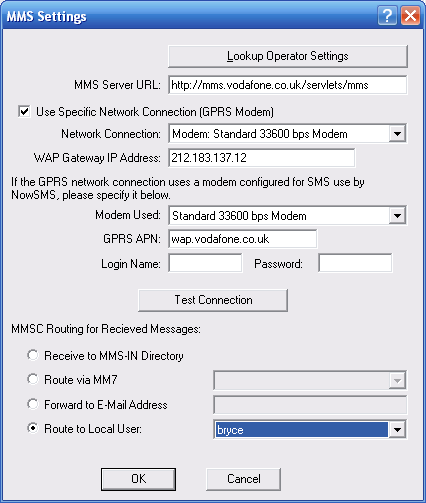 All messages received via any defined “MMSC VASP” connection can also be configured to be forwarded to an e-mail address, using a configuration setting similar to the one defined for GPRS modems. 3.) Unlike SMS, it is possible to configure NowSMS such that if a phone user replies to an MMS message, the reply can be directed to the original message sender. To enable this support, when defining a GPRS modem connection for sending MMS messages (see Connecting to an Operator MMSC – Sending MMS Messages), check the “Embed Original Sender Address in Subject Header” setting. When this setting is enabled, NowSMS will automatically insert “(FM: username)” into the subject header of the MMS message. When NowSMS receives an MMS message, it checks the subject header for this information. If the MMS message is a reply, this information should still be present in the subject header, and NowSMS can route the MMS reply to the appropriate e-mail recipient.